MANILA – On December 11, 2015, consumer electronics giant LG Electronics teamed up with the world’s most exciting mixed martial arts (MMA) organization, ONE Championship to bring about the intense “ONE Championship: Spirit of Champions” match to the SM Mall of Asia Arena. 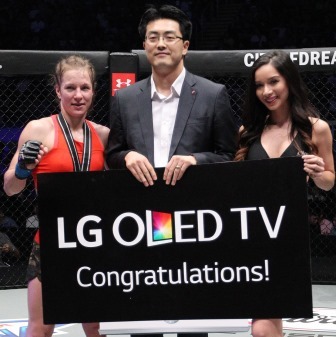 LG Electronics brings the spectacular ONE FC experience to MMA enthusiasts via the ONE Championship app available for free in LG Smart TVs. In photo is heavyweight champion Brandon "The Truth" Vera with the world's first and largest 105-inch LG Super ULTRA HD TV.